USA receptacles manufacturer Glaro Incorporated announces that it offers the single largest collection of all-metal recycling receptacles and recycling stations available for the commercial market. Glaro Inc. is excited to announce that its vast RecyclePro™ recycling receptacles product line includes the largest assortment of designer recycling receptacles available on the market. The expansive line, including single, double and triple stream individual units, as well as connected units forming recycling stations, allows the customer to create virtually any combination, capacity and finish they would like. 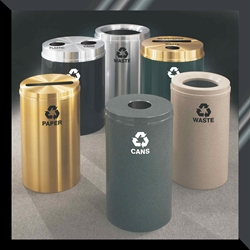 Individual recycling receptacles are available in round designs with unit diameters spanning 12”, 15” and 20”, and capacities ranging from 12 to 33 gallons. In addition, space-saving half round units are available in 18” and 24” widths. Facilities can easily design their customized recycling stations and create multi-stream stations by connecting any number of 12”, 15” or 20” diameter units with Glaro’s easy-to-use connector brackets. Glaro Inc. customers may select their choice of recycling receptacle cover styles. Covers are available with different shaped holes styled for different waste streams. A finish is selected for the cover separately from the finish selected for the body. As a result, sophisticated two-tone as well as monotone design themes can be created to suit any building location. Recycling receptacles manufactured by Glaro Inc. are robust enough to be used in any type or size public or private facility. Executives explain that galvanized steel with powder coat finishes and aluminum materials are ideal for outdoor as well as indoor applications. “Customers appreciate that they are able to find a capacity, design and finish ideal for their specific facility,” added Mr. Betensky. Even with all of these choices, Glaro Inc. has the fastest shipping lead times in the industry with most shipments being made in one to three days. For more information, visit http://glaro.com/recycling.htm or call 1-888-234-1050. Glaro Inc. is the original USA manufacturer of RecyclePro™ recycling receptacles. RecyclePro™ models gained additional notoriety when Glaro Inc. developed the recycling receptacles that ultimately became the standard for the U.S. Senate and the U.S. House of Representatives. Glaro Inc. also manufacturers product lines including bellman and luggage carts, platform trucks, metal trash receptacles, smokers’ posts and receptacles, crowd control posts and systems, safety barriers, signs, sign frames, directories, menu display stands, coat hanging equipment, coat trees, indoor umbrella holders, wet umbrella bag stands, metal planters, and key drop boxes.